The Smart Keyboard provides a full-sized keyboard for getting your thoughts down and a durable cover for everyday protection. It also features innovative technologies that free you from switches, plugs and pairing. 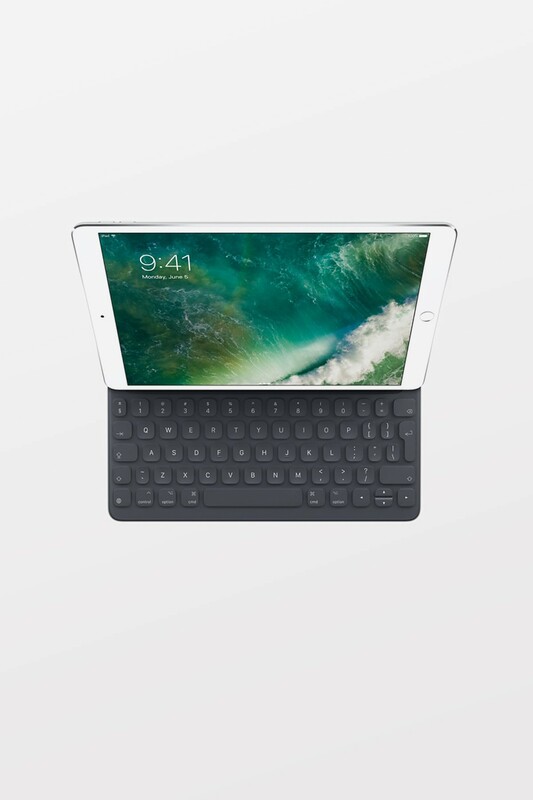 Unfold the Smart Keyboard when you need it. Fold it to create a slim, lightweight cover when you don’t. The elegant design is durable enough to withstand everyday use. And your 23rd draft. Discover all kinds of useful shortcuts for getting things done on your iPad Pro. Bold, italicise or underline — even copy and paste — with just a few taps. You can also customise the bar for third-party apps, so the tools you need are always exactly where you need them. The Smart Connector transfers both data and power between iPad Pro and the Smart Keyboard — no batteries or charging required. Just attach the keyboard and start typing. When you remove it, the onscreen keyboard automatically reappears. There are no gaps between keys to trap crumbs or coffee. Instead, the keys are laser-ablated into a single sheet of durable, custom-woven fabric coated in a water-resistant finish. The fabric also provides spring-like tension for each key, eliminating the need for bulky conventional mechanisms.